As I try to write this post, my stomach is screaming RIDICULOUSLY CHEESY ONION AND ARTICHOKE DIP, but my head is begging me to Google who La La’s mystery boyfriend is instead. Bravo, why do I love you so much?? If you don’t know what I’m talking about, count yourself lucky, and please forgive me for even broaching the subject of trashy reality television to you. For those interested, apparently it’s some big-time movie producer named Randall. I love Google. Now, I can focus on dip. 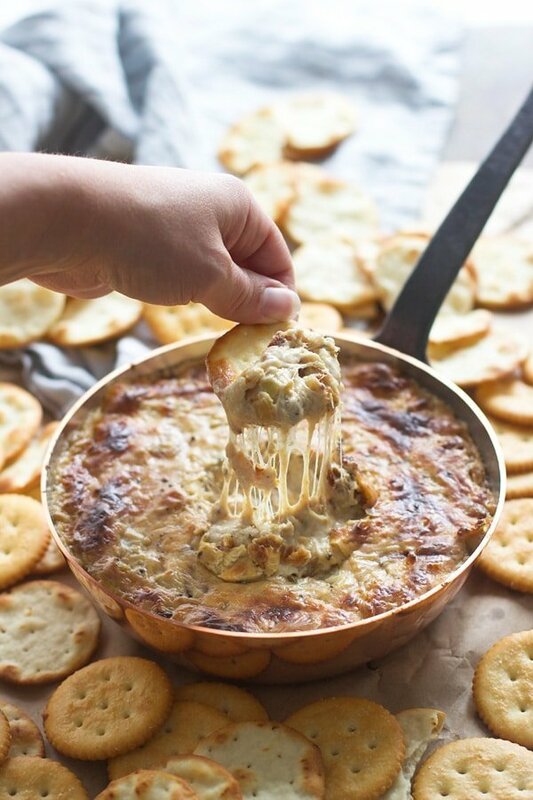 Chances are high that amongst the crispy wings, sliders, and sub sandwiches, there’s also a seven-layer bean dip, crockpot queso, creamy spinach dip, or spicy buffalo dip lingering around, because game day without dip is like Thanksgiving without stuffing. In other words, it’s not game day without it – and the more cheese, the better. 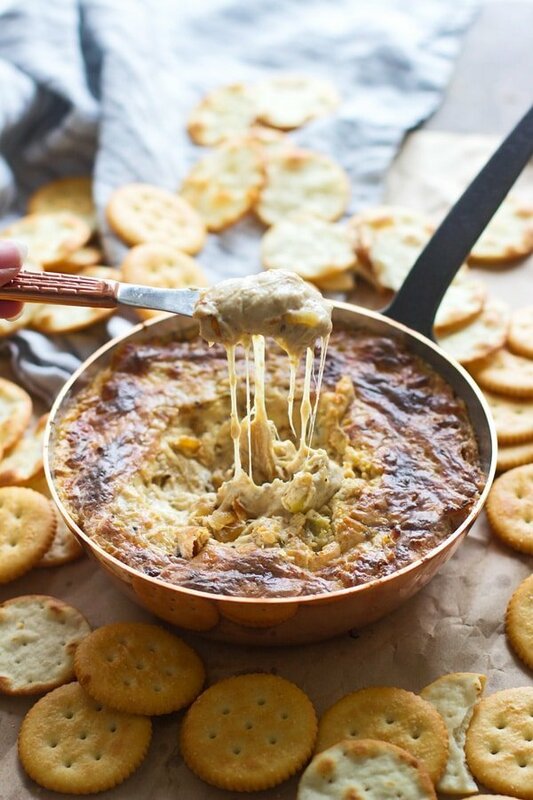 While I adore a classic spinach dip, and can’t stop myself from inhaling copious amounts of tangy buffalo chicken dip, my true love lies with a simple classic – onion dip. Onion dip seems to get a bad rap these days, which I get, since it seems 90% of the recipes for onion dip out there suggest simply combining an onion soup packet and a vat of sour cream. The original version shared a year or so back, resembles nothing of the sort. It’s an adaptation of a Food Network recipe, and uses real onions sautéed in brown butter, sweet vermouth, honey, and plenty of garlic. The mixture is chopped and then it’s combined with a little bit of cream cheese, Greek yogurt and freshly minced chives. To this day it stands as one of my all-time favorite dips, but I wondered what it would taste like if I rearranged the ingredient list and preparation just a bit. In this updated version, I’ve reversed the sour cream to cream cheese ratio, added in an obscene amount of cheese, artichoke hearts, and then instead of serving it cold, I popped it into the oven until it was bubbly, hot and ridiculously gooey. Preheat oven to 425 degrees. Grease a 1-quart baking dish. Add butter to a small skillet. Turn the heat on medium-high. Once butter has melted and begins to brown on the edges, swirl the pan. Continue to swirl the pan until the butter turns a deep brown color and smells nutty, about 2 minutes. Add onions and salt. Reduce the heat to a medium-low and cook onions and caramelized and brown, about 10 minutes. Stir frequently. Once onions have caramelized add garlic. Cook 1 minute. Add red pepper flakes and sweet vermouth. Bring to a boil and reduce to a simmer until the liquid is reduced by half, about 1 minute. Add cream cheese, sour cream, gruyere. mozzarella, mustard, pepper and artichoke hearts. Stir until combined. Transfer to a baking dish and bake until bubbly and golden brown, about 15 minutes. 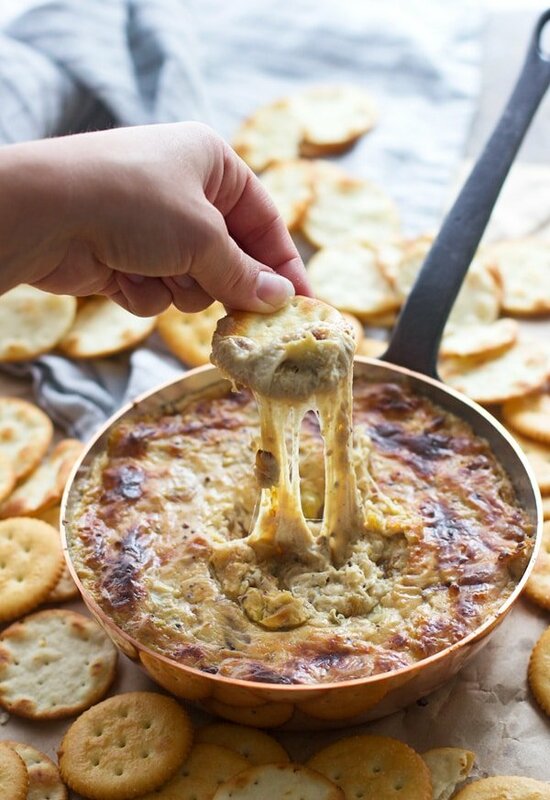 20 Responses to "Ridiculously Cheesy Onion and Artichoke Dip"
Cheesy artichoke dips are one of my favorite things to snack on – on earth!! And when you say things like “ridiculously” I just can’t stop myself from trying this. I agree – cheesy is the best! 🙂 Can’t wait to try it!! Is there something I can sub for the vermouth? Also, I’m assuming the artichokes get mixed in with cheeses? I don’t see them in the steps. You could sub sherry or white wine! If you don’t want to use alcohol, you could omit it altogether, but it really adds a lot of flavor! These instructions don’t include the artichoke? 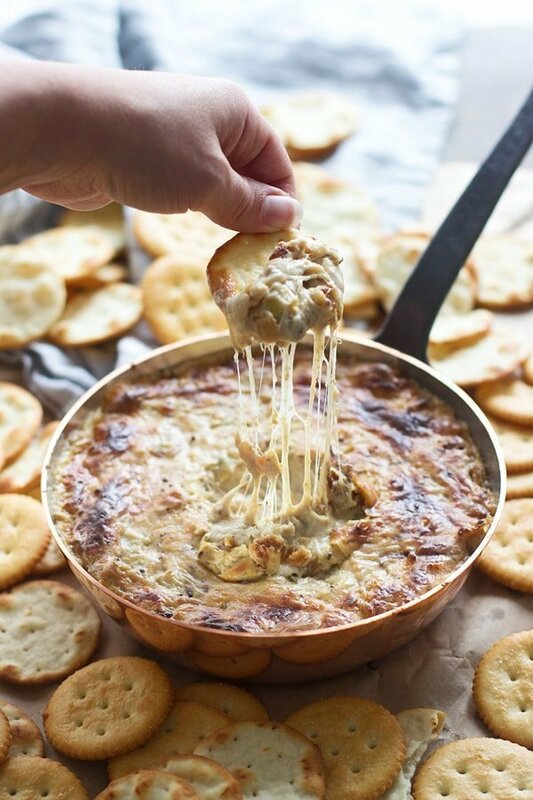 Seeing that this is Onion and Artichoke dip…seems like an important piece to the equation. I like the idea of this dip…but seems like a pretty serious oversight. This is cheese dip so far. Hi Frank. It was accidentally omitted in the instructions. It gets mixed in the with the cheeses, sour cream, salt and pepper. Recipe updated. Thanks for noticing! Whoa! So decadent and delicious! Cannot open the recipe…Where can I find it?? At the bottom of the post!